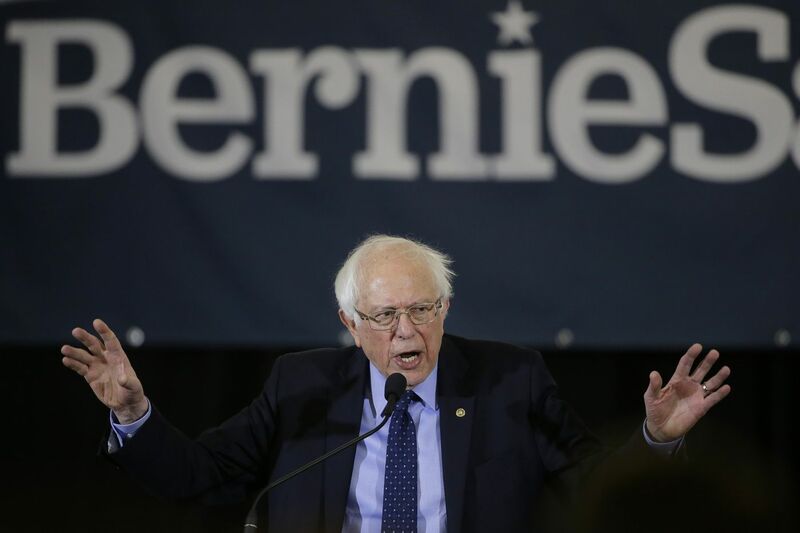 In this March 10, 2019 photo, 2020 Democratic presidential candidate Sen. Bernie Sanders addresses a rally during a campaign stop, in Concord, N.H. The Democratic Socialists of America has endorsed Vermont Sen. Bernie Sanders in his second run for president. The New York-based group says its National Political Committee voted to endorse Sanders at a meeting on Thursday and it’s moving forward with “an independent campaign” to elect him and “advance a class-struggle agenda.” The 77-year-old Sanders announced his Democratic presidential bid last month, promising a government about “economic, social, racial and environmental justice." Competition to nominate a Democrat for president is looking like a Reuben Goldberg machine: tortured complexity in search of a simple outcome. The one goal? Pick someone who can beat President Donald Trump. Plus, like a Goldberg machine (named for the late American cartoonist Reuben Goldberg, who drew humorous “inventions” of questionable value, such as a self-operating napkin), the race has lots of moving parts. And if there are splits over ideology, there also are splits over age, maybe even gender (once burnt?). And the levers and pulleys and springs and sprockets pushing the race are beginning to engage. Reuben Goldberg would have enjoyed that.